Astral People, Handsome Tours & Resident Advisor are excited to announce the return of English electronic duo Autechre this June - their first Australian tour in 8 years. One of the most prominent acts signed with Warp Records. Alongside Aphex Twin, μ-Ziq, Black Dog & LFO, Autechre came to define the UK techno movement in the 90s, creating a legacy that would influence the electronic genre in it's entirety. The Autechre live experience, with support from DJ Andy Maddocks, is coming to Sydney, Melbourne and Dark Mofo, is a classically pitch-dark mind-warping audio affair. Autechre is Rob Brown and Sean Booth, first forming in 1987 after meeting through the Manchester graffiti scene. With a discography that spans decades, their music has exhibited a gradual shift in aesthetics, from techno, electro, and hip hop, to sounds that are considered more abstract in nature. Much of their work features complex rhythms and driving percussion, and more recently, detailed sequencing. Both dedicated to experimenting with various hardware pieces and software programming through MaxMSP, Autechre have increasingly left behind the traditional aspects of melody and harmony in favour of raw sound design, playing with unparalleled textures and sound worlds. In concert, the duo’s music feels un-gridded and spontaneous in a way that few computer or drum machine-backed performers can manage. The Autechre live experience challenges perception, time & reality. "Performing in complete darkness, the duo are barely visible in the glow of the array of green and red display lights flickering on their equipment" (Pitchfork). A track might register as repetitive, yet never actually repeat itself. Another might repeat the same phrase for 20 minutes at a stretch. Often improvising within an opaque world of custom-designed music software, each Autechre live show is as unique as their sound itself. Autechre’s records are seldom anything short of fascinating – and quite unlike anything else, operating within a genre of their own. Their latest release elseq 1-5 dropped in 2016 as a download-only release. Lasting 4 hours and spanning 5 volumes, elseq 1-5 encapsulates the soul of the project - Autechre are no stranger to ambitious endeavours. elseq 1-5 is yet another gem to add to their expansive discography, joining Incunabula (1993), Tri Repetae (1995), Amber(1994), Exai (2013) and many, many more. 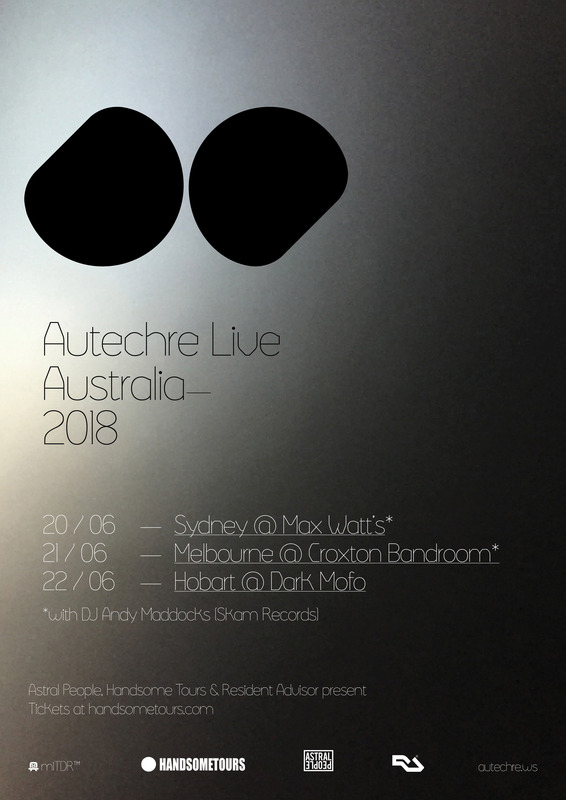 Touring Australia for the first time in 8 years, Autechre are one of the most groundbreaking electronic acts of their generation. The Autechre live experience is not to be missed.